With a bright straw-yellow colour, this wine has delicate, fruity aromas and a palate that balances almond and stone-fruit flavours. Pinot Grigio grapes thrive in the hills south of the Dolomites, benefiting from the cool mountain breezes. With its gentle peach and apricot flavours, this is ideal for enjoying with appetisers, poultry or white meats. Wine of Vigneti Delle Dolomiti, Italy. Sustainably farmed, hand - picked. 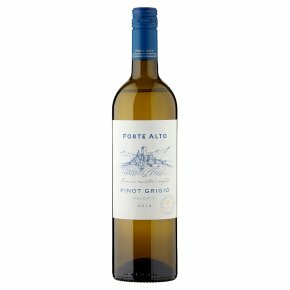 This delightful Pinot Grigio is produced from small vineyard plots on the slopes of the Dolomiti in Northern Italy, an area that is steeped in tradition with legendary castles, picturesque mountains and pristine lakes. The fresh, pure altitude and alluvional soils provide the perfect terroir, and produce fragrant, elegant white wines with minerality as the key expression.